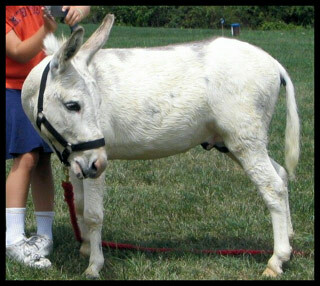 We have downsized our donkey business and have chosen six wonderful animals to continue on with. See their descriptions with their photos. Click on photos to enlarge. 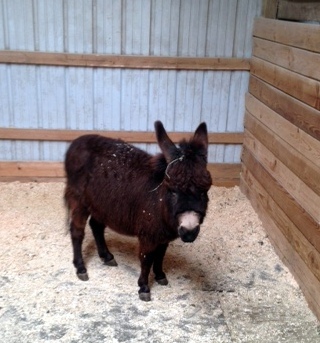 Maggie, our tiny black mini jennet, is bred to Kase, our black mini jack for an early summer foal. Noel, a small standard jennet is also bred to Kase for an early summer foal. We're very excited to meet these two babies in a few months. In this economy people are looking for functionality in animals: guardians, pets, and companions for other animals. 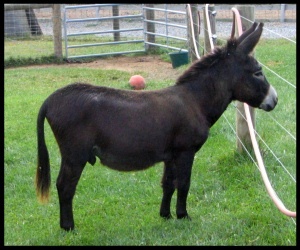 We've had fewer requests for show-type animals so we're tailoring our down-sized donkey business toward customers' needs. We'll be producing fewer foals--probably one or two a year. 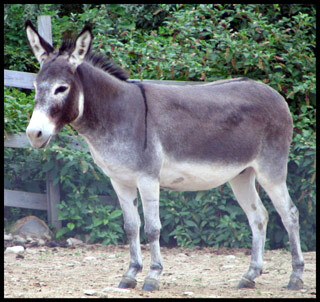 Squirt or Noel and Kase or Cain will produce larger, guardian-type donkeys while Mattie or Maggie and Kase or Cain will produce mini babies. All our donkeys are handled daily and make wonderful family additions. Some just do a better job guarding than others because of size and temperment. Here are our herd sires and their three jennets. Better photo Maggie will be posted when she sheds out. Both jacks are gentle, people oriented, and do not behave in a stud-like manner. Our jennets are gentle and wonderful mothers. Please see their foals and all our past foals on 'Our Foals' page. Copyright 2011 Mountain View Farm. All rights reserved.